Apple CEO Tim Cook dropped in on the Austin, Texas facility that manufactures the new Mac Pro on Thursday, watching as technicians assembled the powerful desktop computers before expressing his appreciation for the new "Made in the USA" approach. 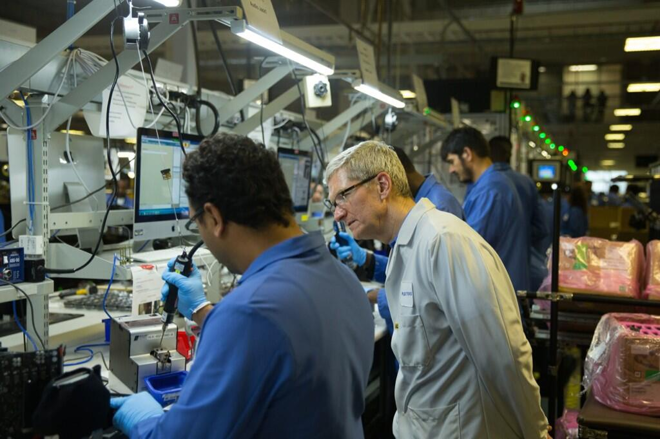 Cook posted a photo of his visit, in which he can be seen peering over the shoulder of an employee who appears to be assembling a small internal component, to Twitter. The visit comes in the midst of a longer trip to the company's newly-expanded Austin campus. As Apple's supply chain and operations chief, Cook was responsible for closing Apple's last American factory —in Elk Grove, Calif. —in 2004 and shifting manufacturing responsibilities entirely to Asian contract manufacturers. As labor costs have risen overseas in recent years, however, Apple has expressed a desire to bring more of its product manufacturing back to the U.S. The company began with a test run of iMacs assembled in California before going full-bore with the Mac Pro facility, which is jointly operated with Taiwanese firm Flextronics. It is not known whether Apple plans to add American plants for its other product lines, but the company's A-series processors are notably manufactured at a Samsung-owned facility not far from the Mac Pro plant.